The holiday season is in full swing. Online shoppers seem to be in a jolly good mood to splurge during the merriest last weeks of the year! 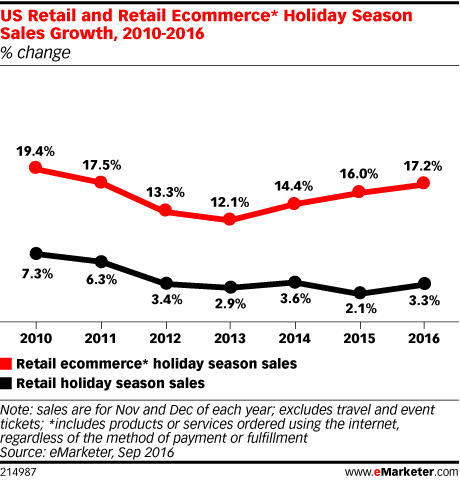 A Jan 2016 report by eMarketer stated holiday retail eCommerce sales will grow by 17% this year – and this is just in the US. In other news, the National Retail Federation has estimated shoppers will spend an average of $935 during November and December of 2016! This means the eCommerce industry has lot on their plates and will ensure the customers’ shopping experiences are an absolute delight with them! In our previous article, we discussed the steps eCommerce businesses should take to attract existing and prospective customers to their online stores and engage with them by offering attractive discounts and fresh products and services. It is true around this time the customers always face plenty of promotional communication from businesses such as holiday sale advertisements, mobile and browser notifications, emailers and what not! Please be sure that as long as the messaging is personalized and relevant, your customers will be more than happy to receive communication from you. But don’t overdo it! So now that you have managed to break the ice with your customers and they have started to pour in large numbers to your website and make purchases – one part of your job is done. Yes – only one, because you have to simultaneously monitor and analyze performance across all online channels and predict your customer’s next step! In the summer of 2014, the online retailer implemented a SAP tool to understand how their customers were making purchases during their summer sale. This helped them to create better email and website marketing campaigns. Naturally, Macys.com saw an impressive rise from 8% to 12% in their online sales in 3 months because of the increased level of personalization in messages on emails and website. The point is that predictive analytics solutions help e-firms understand their customers quickly and accurately. Which channel is taken to reach out to them is, however, a different story and totally depends on the results. With predictive analytics, you can easily guess the kind of products your customers are looking for online. If you have already built a level of trust with customers, then it’s possible to make them buy more. The right predictive analytics tool will streamline the cross-selling process by analyzing the previous purchase made by the customers, their spending habits and overall behaviour. It’s a holiday sale – you have to be sure of the prices you keep for each product category. While overpricing can kill a campaign, underpricing will eventually hurt the overall ROI. Based on the customer’s propensity to purchase, the sales team can test different price points and scenarios to predict the overall outcome of the online sale. Study different criteria such as location, product and marketing shifts. Predictive analytics can help the sales teams understand customer from a research-based approach. To predict the products that have the highest possibility of being purchased not just once but repetitively, showcase your best-selling items on the homepage itself. This is only possible once you know the online shoppers’ inclination towards that particular product range or services. With detailed reporting and extensive data collection, marketers can easily determine each customer’s contribution margin. Collect meat on key points such as loyalty, browsing history, current profitability, etc. to get an accurate estimate of future revenue. This might help you align the sale of your future products around your most valued customers. Giving them what they want every time they arrive on your website is the ultimate goal, isn’t it? Use all your audience data – from social media channels and digital forums to online behaviour and more to create 360 degree user profiles. The better your understanding of users is, the more personalized and effective your holiday sale campaigns will be. Your users behave differently, then why treat them the same way – especially during the holidays? Wigzo helps you automate your marketing processes using 360 degree user profiling. Personalized marketing automation will guarantee you a higher ROI. Custom product recommendations based on what adds value to your users the most is the hack to getting higher conversions. With global profiling for each of your customers, Wigzo makes it possible to create tailored product recommendations for holiday sale campaigns that guarantee a higher conversation rate.